Flat Iron Round Up: Top 5 Irons for Hard To Straighten Hair! Coarse/Resistant Hair: When it comes to reliable flat irons, Babyliss is always a go-to! For course resistant hair, I’m loving the size and variable heat setting of this 1 1/4″ Babyliss Iron. This iron can bump up to 450 degrees which is perfect for resistant hair. Although, we still don’t recommend always using the iron at 450 degrees, lets face it — sometimes we just have to! Fine Curly Hair: So unfortunately for fine hair, there is a bit more of a temperature restriction than other hair types. Because the hair is so fine, it’s far more susceptible to heat damage. That’s why I am LOVING the new Elchim 1-Inch flat iron. It’s a no brainer for fine hair because although the temperature gets hot enough to do it’s job, it’s also maxed out at 360 degrees. Having that control will prevent you from over-frying and over-drying your fine hair, which will leave you will healthier, shinier, AND straighter hair! Thin Frizzy Hair: If you have thin (not fine) frizzy hair, and are looking for an iron to tackle your frizz without leaving your hair completely flat, the Babyliss U-styler will surely be your new favorite iron! I am absolutely in love with this iron for all hair types, but especially for thin hair. The reason why? 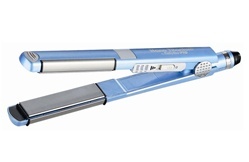 This iron has 3 programmed heat settings of 340, 400, and 450 degrees which work perfectly for thin frizzy, thin curly, and thin resistant hair. Not only that, but this flat iron has an extra hot plate on the side for curling your hair and adding volume. This iron will never leave your hair flat and lifeless! Ethnic Hair: For any type of stubborn or resistant ethnic hair — the Maxiglide is definitely worth every penny. It’s available in 2 different sizes, 1 1/4″ and 2″, making it versatile for anyone and has ten heat settings up to 428 degrees. So, what makes this iron stand out enough to say it’ll tackle the most resistant of hair types? It’s unique Steamburst feature. With this iron (that also has an awesome fine tooth plate to help guide your hair to the smoothest state) you have the option of holding down the steamburst button that’ll knock out your frizz in no time. Bonus? The steam will add tons of moisture and shine to your hair as you go, keeping it crazy healthy as you’re styling!